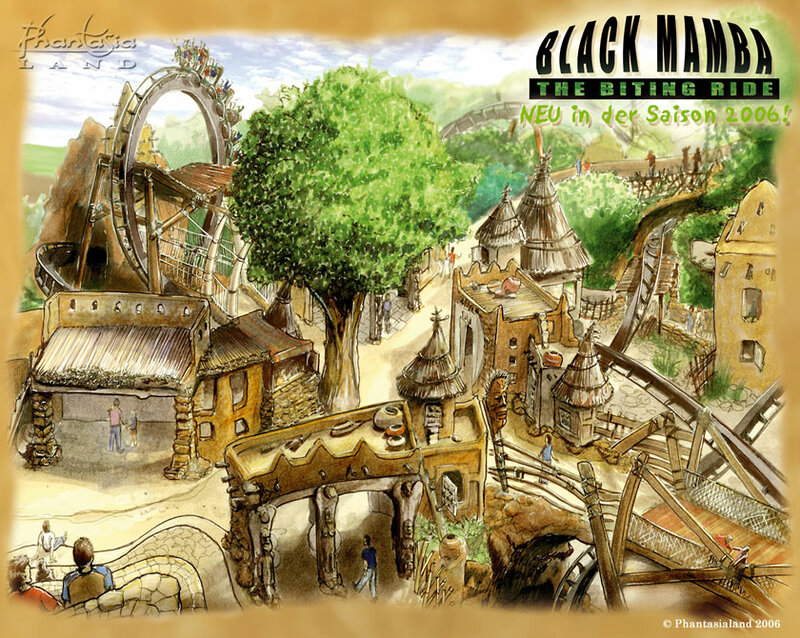 For a long time fans were speculating about it, and now it is published: The opening date of Black Mamba and the Deep in Africa themed area at Phantasialand. On May 24th 2006 at 10am the invited press will experience the ride before the inverted coaster is accessible for the public. The pop group Se-Side will also be there to perform their song "Drums of Africa", which was explicitely composed for Black Mamba. Already the day before, on May 23rd, an exclusive pre-opening will take place. The first public ride is scheduled for 3pm, on the Deep in Africa website there currently is an auction for the tickets. Prices start at 150 Euros for the front row and 100 Euros for the other seats. The 32 participants in the first run can then ride Black Mamba until 6pm - together with 100 other guests with pre-opening tickets. Those tickets, too, are auctioned off, with an initial price of 50 Euros including park admission. The revenue will be donated to the RTL contribution marathon for building a primary school in Malawi. Black Mamba is the first Inverted Coaster of Bolliger & Mabillard in Germany. The Swiss company is the precursor for this type of coaster and is highly rated among enthusiasts for their intense and high quality rides. Coasters like Katun (Mirabilandia, Italien), Montu (Busch Gardens Tampa Bay, Florida), Dueling Dragons (Islands of Adventure, Florida), Pyrenees (Parque España, Japan) or Alpengeist (Busch Gardens Williamsburg, Virginia) are regularly voted among the top rides in several rankings. Nemesis (Alton Towers, England) is among the world's top coasters not just because of its elaborate theming. This top position could very soon be held by Black Mamba. On the 24th of May - or the 23rd of May for those with the necessary amount of spare money - discussions will start.